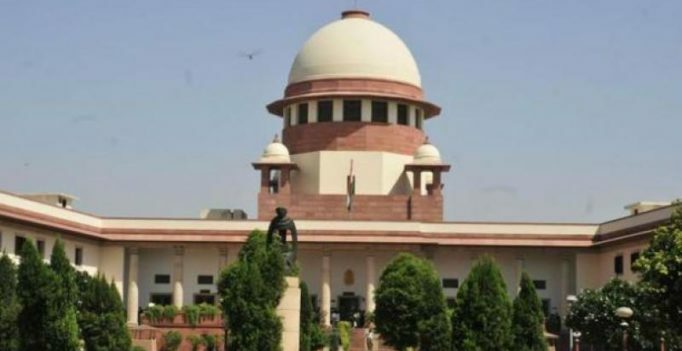 New Delhi: The issue of Article 35A, which provides special rights to the citizens of Jammu & Kashmir, seems to be heading into a major controversy with the Supreme Court on Monday saying a constitution bench may examine whether it is gender-biased and violative of the basic structure. It tagged a plea challenging Article 35A of the Constitution with a similar pending petition to be heard by a three-judge bench. “We really feel the issue should go to five-judge constitution bench but that has to be decided by a three-judge bench. If Article 35A violates the basic structure of the Constitution or if it ultra vires to the procedure, then the issue may be dealt by a five-judge bench,” a bench headed by Justices Dipak Misra and A M Khanwilkar said. During the hearing, Additional Solicitor General P S Narasimha informed the bench that a similar prayer challenging Article 35A exists in another plea filed by a Delhi-based NGO ‘We the Citizens’ which has been referred to a three-judge bench. He submitted that the present plea filed by one Dr Charu Wali Khanna should be tagged along with the pending writ petition, which will be heard by a three-judge bench. Advocate Shoeb Alam, appearing for the J and K government, said the issue has already been “prima facie settled” by the High Court in its verdict in 2002. He said that in Dr Susheela Sawhney versus state of Jammu and Kashmir, this issue has been settled by a full bench of the High Court in 2002. In that case, the full bench of High Court in its majority view had held that a daughter of a permanent resident marrying a non-permanent resident will not lose the status of permanent resident of the state of Jammu and Kashmir. The submissions were opposed by petitioner’s advocate Bimal Jad, who said that no formal notice has been issued in the matter to the state government and it cannot put forth its view at this juncture. He said his plea challenges Article 35A on two grounds, that it is gender biased and is volative of the fundamental rights guaranteed under Article 14 (equality before the law and equal protection within the territory of India). Narasimha said the three-judge bench will hear the matter tentatively by August 29. The bench said the matter will be listed before a bench of three-judge bench, adding that if the issue required to be heard by a five-judge constitution bench, then the three-judge bench may refer it. The petitioner has also challenged Section 6 of the Jammu and Kashmir Constitution which deals with the “permanent residents” of the state. The plea has challenged certain provisions of the J and K Constitution which deny property rights to a woman and her children who marries a person from outside the state. Article 35A, empowers the state’s legislature to frame any law without attracting a challenge on the grounds of violating the Right to Equality of people from other states or any other right under the Indian Constitution. “Section 6 of the Jammu and Kashmir Constitution restricts the basic right of women to marry a man of their choice by not giving the heirs any right to property if the woman marries a man not holding the Permanent Resident Certificate. “Her children are denied a permanent resident certificate thereby considering them illegitimate — not given any right to such a woman’s property even if she is a permanent resident of Jammu and Kashmir,” the plea, filed through advocate Bimal Roy Jad, said. The petitioner said that as per the provisions, if a woman marries a person outside Jammu and Kashmir, then she loses property rights as well as employment opportunities in the state. While Jammu and Kashmir’s Non-Permanent Resident Certificate holders can vote in Lok Sabha elections, the same individual is barred to vote in local elections in the state. In a related matter filed by the NGO ‘We The Citizens’ challenging Article 35A of the Constitution, a bench headed by the Chief Justice on July 17, had referred the case to a larger three-judge bench for final disposal.